I (Bob) was looking over recent posts and it occurred to me that one could gain the impression from the blog posts that all we do here is go sight seeing and take pretty pictures. It is true that we have seen some local beautiful areas but, in reality, most days are full of errands related to settling in here and work related to the farm and house. It seems that every area of life takes more work, partly because we are new here and getting things set up and party because it is a rural area and everything seems to take more time. Internet access. We are learning the trials and tribulations of rural internet access. We waited for weeks to get our sites to get tested by one company only to be told that their signal at the new house sit isn’t strong enough for service. The next company that serves this area came today and we were pleased to learn that the signal at both the cottage and the new house site is good. So, in about 8 more days, we should get internet access! Now if only we could improve our cell phone access. I should have taken a picture of the technician putting up his testing device but didn’t think of it until after he was gone. Cleaning up the house site and cutting fire wood. When they cleared our building site, we asked that they put some of the tree trunks aside so that I could cut them up for firewood. That left quite a mess that now we need to clean up. 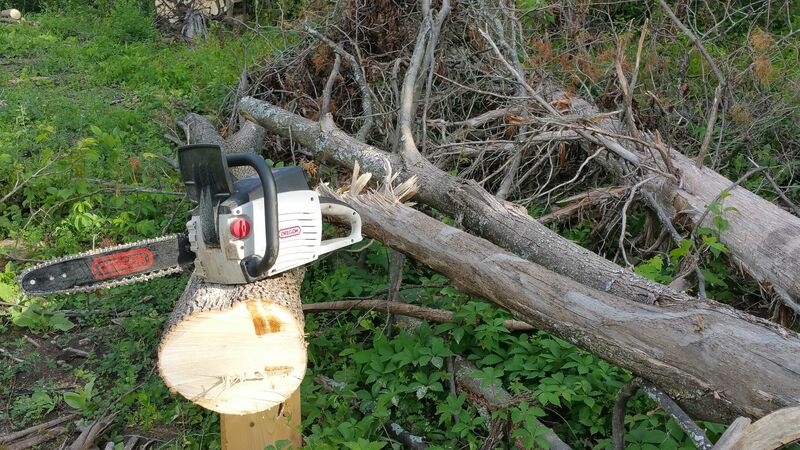 I try to spend some time every day cutting and splitting wood. 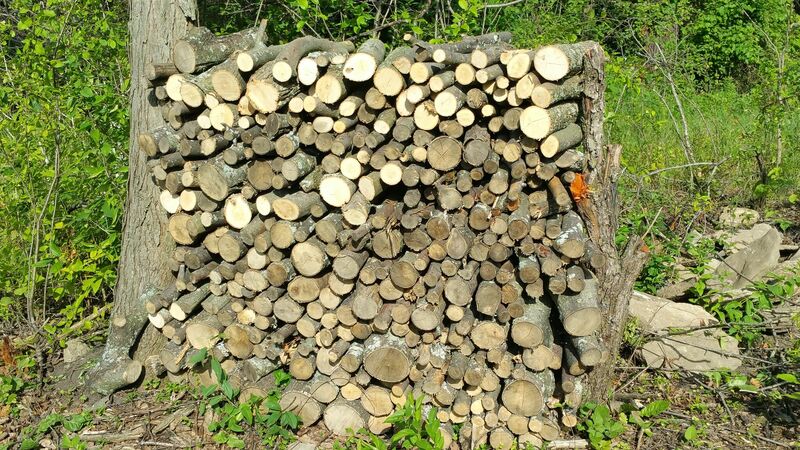 Sheila has mastered the art of stacking the wood and it is gratifying to see the number of tree trunks lying on the ground go down and the stacks of wood go up. Our house will have a propane furnace (no natural gas out in the country here) but we hope to do most of our heating with a wood stove. we now have several such stacks around the house site and are working hard so that their number grows quickly! Grass and weed mowing. Cutting, splitting and stacking wood can be rather hot jobs, especially as we have had hot and humid weather for the past few days. 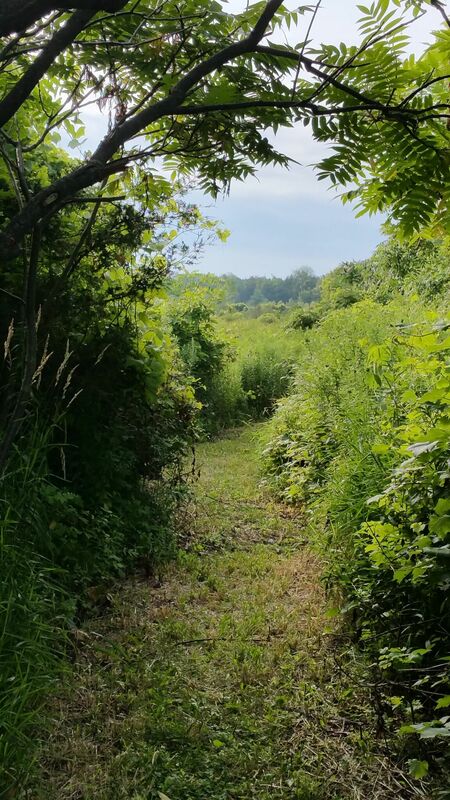 But nothing has been quite so hot and tiring as cutting grass and weeds with the mower to keep the trail open and to create good access to the trees in Jonathan’s orchard. Fortunately, our trusty lawn mower is heavy duty but it sure takes work to push it through grass and weeks up to 4 feet high! Inside these tubes are apple, pear or various kind of nut seedlings. 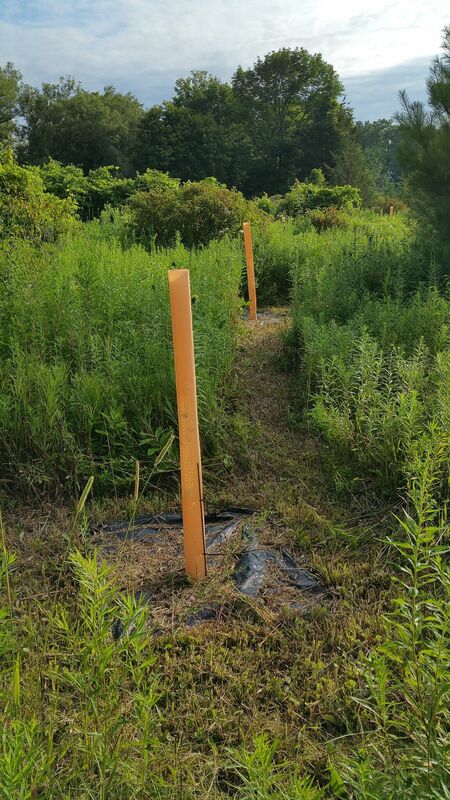 The 4 foot high tubes provide protection from browsing deer and chewing rodents. We certainly have enjoyed having the trail mowed. It certainly beats wading through tall grasses, weeds and bushes. Was interested to learn of the fossils..It does look like a lot of work clearing pathways and cutting wood. It certainly is a beautiful piece of property! Good to know that you are settling into rural life and enjoying it! Ted had taken some photos of the farm and it has been good to imagine you there!